An ancient cultural crossroads blessed with rich cultures, ruined cities and dramatic landscapes, Turkmenistan is Central Asia's least visited and most mysterious nation. 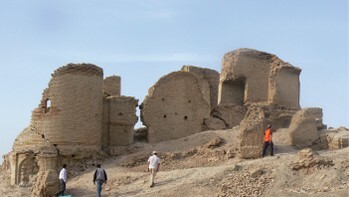 It was across these remote lands that nomadic empires, ancient conquerors and Silk Road traders traversed, leaving behind a rich cultural and archaeological legacy. 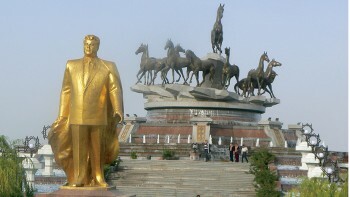 Join us as we explore the highlights of Turkmenistan! Explore incredible ancient ruins at the sprawling archaeological site of Merv, once a major oasis city along the famous Silk Road trading route; and marvel at the haunting landscapes of the Karakum Desert. Head to the laidback capital of Ashgabat to explore mosques, museums and monuments, as well as the Palace of Turkmenbashi and the nearby ancient ruins of Nisa, one of the earliest and most important cities of the Parthian Empire. 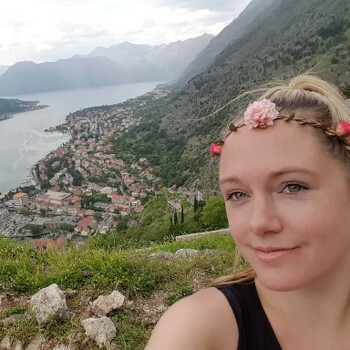 Engage with rich local cultures; trawl colourful markets for vibrant carpets and handicrafts; and enjoy the famous hospitality of some of the friendliest people you'll ever meet. Take a look at our Central Asia Journey or Tashkent to Isfahan adventures to get a taste of this isolated gem of Central Asia. Explore the beautiful capital, home to one of the largest mosques in Central Asia, the Kipchak Mosque. The history museum of Mary houses one of the richest collections of artifacts and woven rugs. 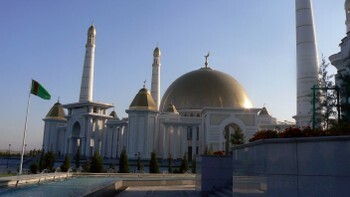 Located in the city of Ashgabat, the intriguing palace is a must see. 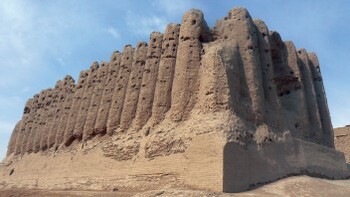 The UNESCO World Heritage site at Nisa, is one of the earliest and most important cities of the Parthian Empire. Quality services at the best prices make our Turmkenistan adventures great value for money. We aim to incorporate as many inclusions as possible in the tour cost such as most meals, sightseeing and entry fees, transfers and quality accommodations, eliminating the risk of having to carry large sums of money with you on your journey. 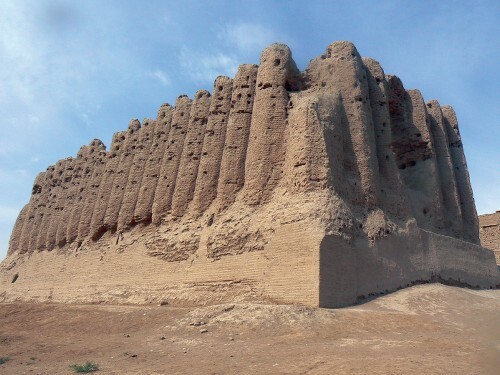 An ancient land on the Silk Route with trading posts dating back more than 8000 years, there is much history and culture to be experienced in Turkmenistan. We travel off the beaten path to explore historic towns including Marv and Ashgabat on foot, encompassing the highlights that this unique land has to offer. Our guides in the field are what make your Turkmenistan adventure special. Their passion and professionalism will shine through as they share their extensive knowledge while you discover the culture that they are so proud of. We use quality inns, typically situated in natural environments. They are not luxury inns however we ensure they offer you a truly authentic experience. Jabbar has been working as an English-speaking guide for more than six years. Jabbar was raised in northern Afghanistan before returning to his ancestral homeland in the early '90s. 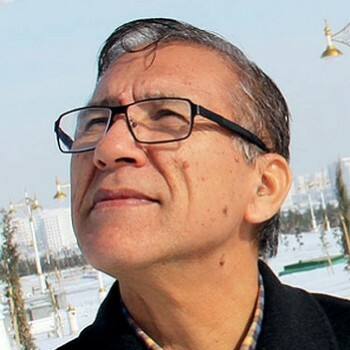 He is interested in all things that make up the Turkmen identity, from history to flora and fauna, as well as legends and linguistics. He loves sharing local legends over a camp fire to bring the Turkmen spirit alive for you during your visit through Turkmenistan. Turkmenistan has a cold desert climate that is severely continental. Summers are long (from May through September), hot, and dry, while winters generally are mild and dry, although occasionally cold and damp in the north. Most precipitation falls between January and May; precipitation is slight throughout the country, with annual averages ranging from 300 millimetres in the Kopet Dag to 80 millimetres in the northwest. The capital, Ashgabat, close to the Iranian border in south-central Turkmenistan, averages 225 millimetres (8.9 in) of rainfall annually. Average annual temperatures range from highs of 16.8 °C in Ashgabat to lows of -5.5 °C in Dasoguz, on the Uzbek border in north-central Turkmenistan. The almost constant winds are northerly, north-easterly, or westerly. USD is the only currency recommended to carry as it is the easiest to change. You will be able to change both large and small denominations. Credit cards are of limited use in Turkmenistan. Electricity in Turkmenistan is 220 Volts, at 50 hertz. The most common pin type is C. (2 round prong). The visa for Turkmenistan is arranged by our local operator as a group visa. The cost of this visa is US$60 per person. Again you must carry with you the correct money in USD on arrival plus some extra for any changes in the price. The visa is obtained on the border by our Turkmenistan representative. In order to arrange your Visa on Arrival (VOA) please complete the Turkmenistan visa form and provide a scanned copy of your passport. You will need to have 2-4 passport photo’ for each to accompany each application, although it is always recommended to carry some spares.